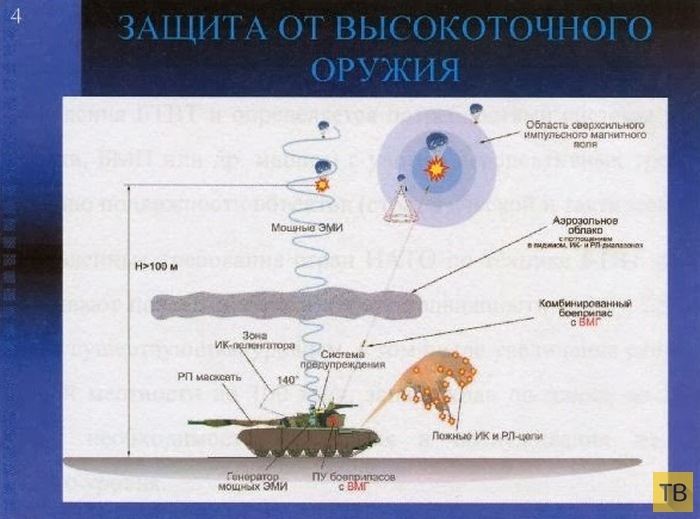 While much has been written about the T-14 Armata’s layout and armament, the Afghanit active protection system, or APS, utilized on the Armata also contains many innovations and even some systems that have never been seen on an APS before. While all these systems are in position to detect when the tank is being attacked, the T-14 also has some “stealth” features that are aimed at preventing it from being detected in the first place. Some sources state that “Ternovik” radar-absorbing material is utilized on the Armata to make it harder to detect by ground search radar. If an incoming projectile is not diverted at this point, the Afghanit hard-kill systems active. Unlike earlier Drozd and Arena systems which used large shotgun blasts of fragments to destroy projectiles, Afghanit uses a small homing projectile to destroy incoming projectiles. According to Russian sources, the hard kill component can intercept projectiles going up to 1.7 kilometers per second.